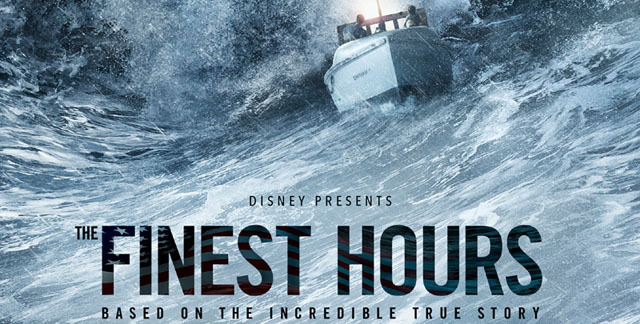 The waterlogged disaster movie The Finest Hours is a moderately gripping whoosh of nostalgia. The cast, let by Chris Pine, Casey Affleck and Eric Bana, tell a story about a ship that gets ripped in half by the tortuous seas off the coat of Cape Cod one wintry night in 1952. The half of the ship that remained intact has crew members desperately trying to keep going until someone can find and rescue what’s left of the survivors. Casey Affleck, whose character is Ray Sybert, does as best he can to get the motor running on a broken ship and stop his men fleeing into dangerous waters facing certain death. It was a cold and harrowing struggle as this man knew the ship inside and out and wanted to give these men a shot at surviving. It was nearly impossible as they only had half of the ship left. Chris Pine does a wonderful job as Bernie Webber, the man instructed to head up the Coast Guard mission to save the men from this particular ship. Webber, with a crew of three beside himself on a small boat, sets out into these awful weather conditions. Webber goes from a shy type to a true captain through the arch of the story. While it depends on your definition on what makes a man, this certainly did for him. Eric Bana does not necessarily play the bad guy in this film, playing Daniel Cuff, although he is not a likable character and does a great job of doing so. Cuff sends out a small team into what was basically a suicide mission and demanded they return with multiple survivors that could barely fit on the small rescue boat. The movie itself is based on the true story of what is still considered the greatest feat of heroism in US Coast Guard history. It is action-packed and will have you feeling like you’re on a ride from Universal Studios even if not watched in 3D. A great, true story that will live on for years about love, braveness and the selflessness of a few good men is 4 out of 5 stars.